This is a great way to use leftover roast vegetables. Ours were from the Christmas Day roast dinner. This is a cold salad, so it is quick to make – just chop up the roast vegetables from the fridge. It is also a very tasty salad, and Mum and I enjoyed it very much. Especially since Mum had said “It’s an experiement, I haven’t tried it before”. She had seen a recipe like this before, but didn’t know where and so had nothing to refer to. Mum prepared the couscous ahead of time. Using ½ a Massel Vegetable Stock cube with a small amount of hot water, just enough to dissolve the cube in. 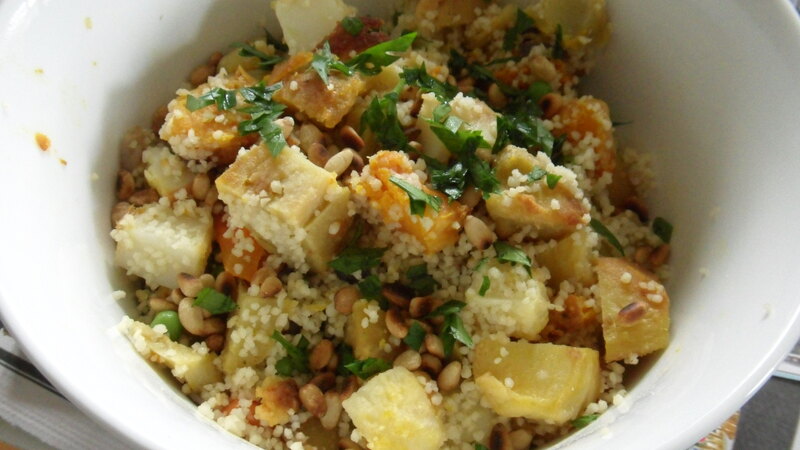 When the cube is dissolved, add couscous. Pour boiling water over the couscous until there is about 1 cm of water covering the top. Leave to soak. Chop up roast vegetables. We had potato, kumara, pumpkin, parsnip and onion, plus leftover boiled peas. These were added cold into the couscous and stirred in. Add toasted pinenuts as a garnish with some flat leaf parsley, “to add piquancy. A zing” as Mum said. I had this salad with some fried tofu cubes marinated in ginger and honey. The salad with this combination was divine. Mum had cold meat with hers and said she should have had the tofu as it was much nicer than the meat. The next night, with the leftovers, I chopped the cubes of marinated tofu up very small and added them into the remaining Roast Vegetable Couscous Salad. We also added a bit of chopped mint and a squeeze of lemon juice. Again, it was so yummy.